What’s the story with raths? Anyone who grew up in rural Ireland and many who grew up in the towns and cities know something of our raths. Some are quite large like the one in Dunmore you see in the picture above. You may have heard of them called fairy forts, ring forts, or fairy raths. 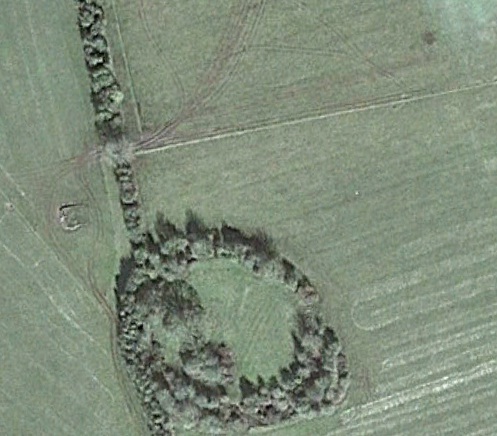 They vary quite a bit in structure from small innocuous looking clumps of trees up to large moated rings with underground channels or souterrains. The experts classify them as ring forts, hill forts, enclosures and general raths. They are amongst the most common field monuments in Ireland. A clue is provided in the fact that so many placenames begin with Rath… Others, such as Laragh, where I come from, also refer. Laragh was originally Leath Rath or half rath. Over sixty thousand of them survive. Many others have been levelled. On my own farm in Kilkenny a very large rath was levelled by a previous owner in the 1960′s. 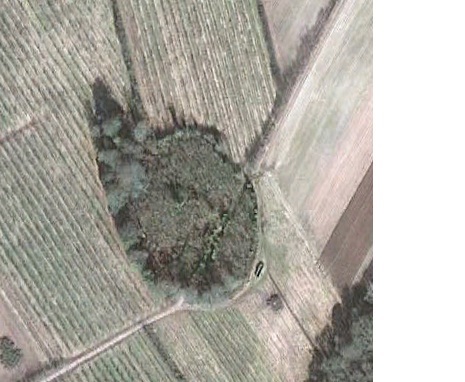 All that remains of it is the circular ring of different growth betraying where the enclosure ditch was filled in. Only one of three raths that were marked on an 1860′s ordinance survey map of our area, still exists. 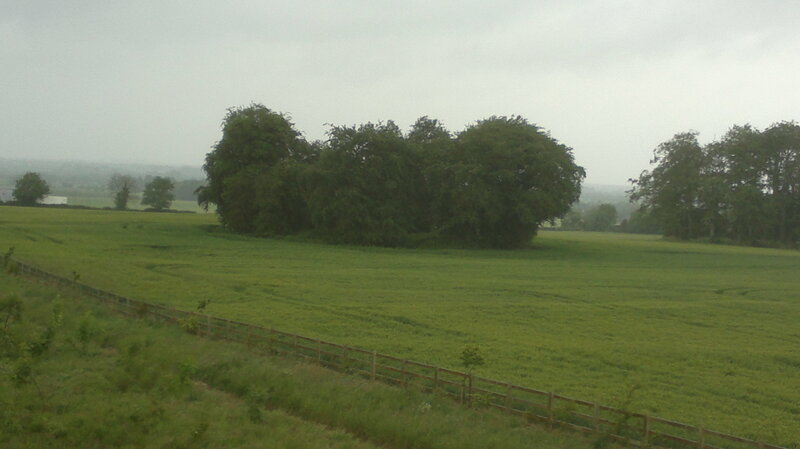 It was on top of a small hill and is similar in proportions to a hill fort in South Kilkenny that was excavated by archeologists and deemed to be an enclosure from the Bronze age. This is typical of the situation around the country. Even in recent times when people ought to have known better, raths have been levelled. Who lived in the raths? The archaeologists and historians tell us that most raths were enclosures in which a fine (extended family or sub-clan) lived. The perimeter in many cases would have been a moat, a stone wall or a thorny fence, depending on whether your land grew hedges or grew stones! Inside the perimeter the homes of the families were built. There were also shelters for animals, kilns for drying grain, religious and burial structures and in some there were ‘souterrains’ or underground chambers. Some animals would have been brought in for milking or to protect at night from wolves and robbers. Most building in Ireland back then was of timber so little evidence survives of these homesteads other than traces of poles in the ground. Outside the perimeter were fields that were allocated to various members of the fine to use. The allocation of such land was done according to very ancient and complex Brehon law (more on that soon). The people of the country however had a different explanation than the archaeologists. They believed that the rath is the home of the little people or the good people. I never heard them referred to directly as fairies – and wonder whether this name was imported in recent centuries. And people were always afraid of offending the little people because they could do a lot of unpleasant things when riled. More on this another day. One possible explanation for the belief that the rath belongs to people with magical powers and who are quick to take a grudge, is found in the Labor Gabala or the book of invasions. This is one of several manuscripts written by monks many centuries ago. The books are generally regarded as containing the first written recordings of the knowledge passed down by countless generations of poets and scholars – though the monks naturally may have put their own spin on some of the material. This particular book sets out a history of a wave of invasions of Ireland. I will come back to this. What is relevant here from the Labor Gabala is that it says that one of the previous peoples of Ireland were the Tuatha Dé Danann. The Dé Danann were defeated by our ancestors, the Milesians. (Scientists have a different take on this. But just as interesting. Oh dear, another thing I have to come back to later.) In the truce that followed, the Dé Danann were relegated to the underworld and the big people took most of the visible countryside. The raths are the only visible portals to the magical world of the Tuatha Dé Danann, who became known to us as the little people or the fairies. You can imagine why such a people, truce or no truce, might take umbrage at any intrusion on a rath! That is, the raths became the homes of the fairies, people who did nobody any harm as long as you left them alone; people who on the other hand could do you a great deal of harm if you interfered with one of them or did damage to their homes, the raths or fairy forts. There are many people in the country who have heard music or seen lights at night coming from a rath. There are many young people as well as old who will not ever harm even a branch of a tree in a rath because they do not want to upset the balance. The common view is that most raths were constructed between the 5th and the 9th century. However, relatively few have been excavated by archeologists and this is therefore not an established fact. Some ring forts that have been excavated have revealed Bronze Age as well as Iron Age and stone artefacts. From this and from the fact that raths vary considerably in size, shape, and layout, it is possible they were created in various eras and some may have been adapted and changed over several eras. It’s conceivable that some were first formed not long after people first came here about nine thousand years ago. The truth is that there are probably as many answers are there are raths. The very fine ring fort in the picture below is also in County Kilkenny and is a credit to the land owners as there is no evidence of any interference over recent decades. What protection is there for raths? In times past no protection was needed other than that bestowed by fairies and púcas. Many people still fear that if they went too near a rath with an excavator or cut branches from a rath, they would be followed to an early grave by bad luck. There is something else – another protection that the raths secretly enjoyed. They were unofficial burial grounds of babies. Until recently, a rule of the Catholic Church was that an unbaptized person could not be buried in ‘consecrated ground’. What this meant was that babies who died before they could be baptized could not be buried in their family plots in the local graveyard. This cruel law meant that many silently grieving families had to find some other place to bury the beloved child. Some sneaked into the graveyard at night and buried their children in the family plot regardless of what the priests had said. Others buried babies in old church grounds. Many however went to the nearest rath. If the modern God would not accept their little ones, the ancient Gods would accept them. Babies buried in raths were thought to be protected by the fairies. And it was assumed that nobody would ever disturb the graves of these little people. I think that farmers who level raths probably do so in ignorance rather than simply out of greed for more land. If younger farmers were reminded about the heritage and history, not to speak of the bodies of babies, few would dream of damaging a rath. Of course you can’t always rely on good will. You need laws too. Raths are listed in these inventories (along with other precious heritage sites such as fulachta fiadh, souterrains, and megalithic sites). That means they are now protected under the Monuments Act of 1930. It is now a serious criminal offence to damage a rath. Only last week the first prosecution under this legislation saw a Kerry farmer heavily fined for destroying a ring fort. In the image above you see the circular outline of what may have been a fulacht fian. Also interesting in this image of bogland is the ridges. They are often called famine ridges. Before the great famine the land was so densely populated that even poor bogland like this was tilled for growing potatoes. Because the land is so poor, it has never been ploughed since – with the consequence of providing us a sad reminder of a population almost wiped off the face of the earth. Farmers who own the land on which a rath is situated must come to see themselves as their ancestors did – not as owners of the rath but as privileged custodians and protectors of these monuments. They must be guardians of the peace, and ensue that we keep the truce with Tuatha Dé Danann.